﻿ IELTS Writing practice by MT - Learning English - WE Club - Powered by Discuz! Hello, guys! I am here to post a wrting of a member in our IELTS Preparation group. Some people believe thatvisitors to other countries should follow local customers and behavior. 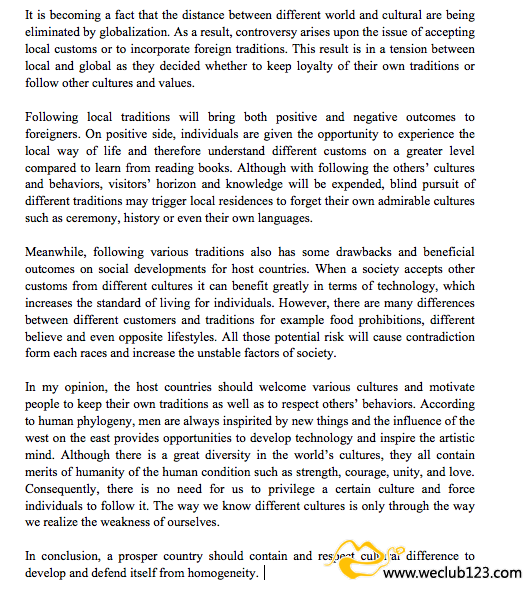 Othersdisagree and think that the host country should welcome cultural differences.Discuss both these views and give your own opinions. My comment to this essay is that it is a bit too long. You might not have enough time to write such a long essay in 40 minutes. GMT+10, 2019-4-19 14:17 , Processed in 0.508143 second(s), 26 queries .